The highly anticipated OPEC meeting drew no conclusions and leaves the price of oil at the bottom with further downside. Traders are also concerned that the meeting between members of the Organization of the Petroleum Exporting Countries yesterday concluded without reaching an agreement on production cuts. The oil cartel and non-member oil producers are expected to give more details on the size of production cuts during today's meeting. However, the downside bias for the black gold remains the same as traders and investors are skeptical that there will be not enough production cuts. Oil prices are back on the downside despite getting support from the $50.17 level. 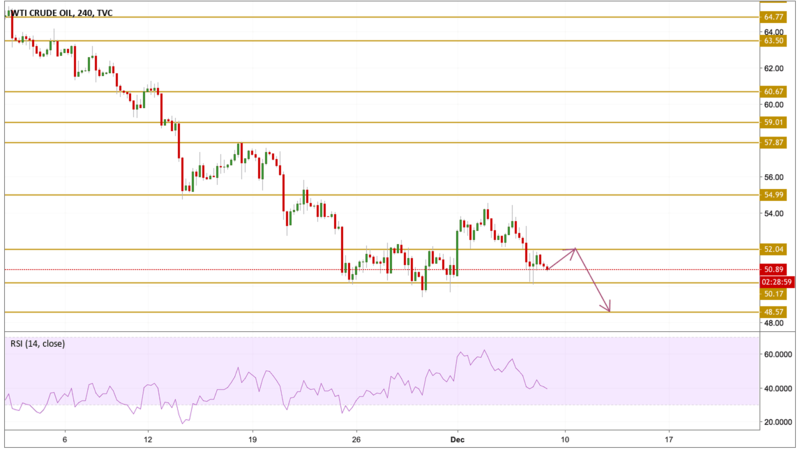 The price is currently hovering around the $51 level while failing to recover with a bearish momentum as the RSI points out. We believe that this consolidation is key for a further move to the downside, that is why we will be focusing on the $48.57 support level.